Bear baiting is a "tricky subject." Rules and regs vary greatly from state-to-state, and indeed, can vary from year to year – even season to season. Be cautious, and check out your state or area regs carefully before baiting. In a previous article we mentioned that you want to start baiting in early spring. In Wisconsin, that means after April 14th - - not earlier, and you can't bait from the day after the previous bear season closes until April 14. But that's Wisconsin. Your state or area may very well be different. We can't overemphasize the need for strict adherence to baiting regulations. It's tough enough getting a bear tag, and you don't want to jeopardize your hunting status by "dissing" the regs. What we're going to do is tell you generic methods of baiting which you can readily adapt to your own local bear regulatory system. The regulations and requirements we cite are for WISCONSIN. Please remember that I lived in far Northwestern Wisconsin for 15 years, on a lake, right in the middle of a national forest. As far as I know, this particular area still has the largest per-acre black bear population in North America. And yes - -it is true – the largest "on-the-hoof-before-dressing-out" black bear I've ever seen came in at 675 pounds. So there are some "biggies" out there. And while I personally don't care for bear as a food, my husband and many others love it. He describes the taste as "delicate, sweet pork." In Cheesehead Land (Wisconsin), you can't use more than ten gallons of bait at any one site. The bait itself must be totally concealed and closed, with rocks, or natural logs over it. The reason for this is to insure that deer can't get at the bait (deer baiting is prohibited in many areas anyway). Your bait cannot contain any animal parts or animal residue. That means no meat, no bones, or fish, solid or liquid animal fat, bacon grease, or any animal carcass part; and, NO HONEY! The bait station itself must be ALL NATURAL. No metal, glass, boxes, plastics, or containers. Nothing that has been humanly-processed. As to the baits themselves: We use one of two sources, and, I repeat from previous articles – we try to champion the use of the least expensive methods possible. In these economic times, if you can save a buck, "go for it!" And saving money doesn't mean you're going to be any less successful than the person who spends a lot. Indeed, you'll probably do better. Go to a local bakery or grocery store. Get outdated pastries, doughnuts, buns, old bread -- whatever. And, friends, we promise you that there are usually places that will give you this stuff FREE. You can also go to an area bait dealer who specialize in baits -- including bear. Use some of this stuff to complement and enhance the "freebies". Legal things like cinnamon chips, different flavors of frosting -- lots of stuff. If you keep your bait different or "fresh", you'll keep the black bears interested and saying to themselves: "Wonder what I'll find today?" We won't go to McDonald's every day; we want a change of pace -- so we try Burger King or Hardee's. Bears are the same. And what this "different bait" approach also does is prevent another hunter who may start a bait station just a couple of weeks before the season opens from "glomming" your "bear faithful" to his bait station, just because his stuff is new and different, as opposed to your "same-old-same-old." Keep your bait station changing -- and start baiting as early as the laws in your particular state or area allow you to do so. We also make our own concoctions, which have proven extremely successful. Get a lot of old bread, put it in a five gallon drum, and mix in molasses, or a cherry or butterscotch-flavored syrup, then dump it all in a bait station hole and cover it. Then douse the whole "covering" with liquid smoke (which is legal -- scent or liquid doesn't have to be covered). This scent diffuses through the whole woods – and you can smell it a hundred yards from the bait station – and if you can smell it a hundred yards away, a black bear will pick up the scent a quarter of a mile away! 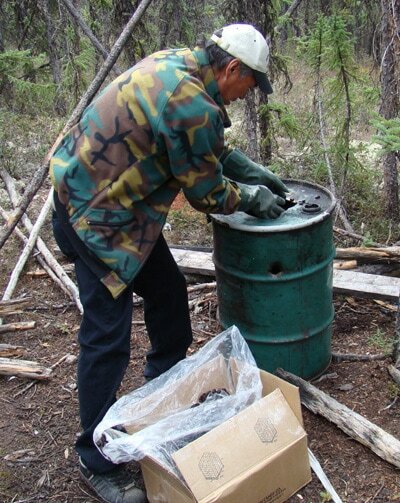 The bears will be attracted to the spot, and voila, they'll discover your bait. By the way, you don't have to use ten gallons at any one site, even though it may be legal to do so. Five gallons at any one site is more than enough. Don't overdo. You'll save money, effort, time, and accomplish the same things. So, grilled "bear chops," anyone? Yummm! -(Phil Schweik of Hooksetters Guide Services contributed to this article).